We at WM Agri & Holaras UK are very excited to be able to s how the Holaras Viking Grass Spreader for the very first time as a debut exhibitor and also as a new concept of machine! 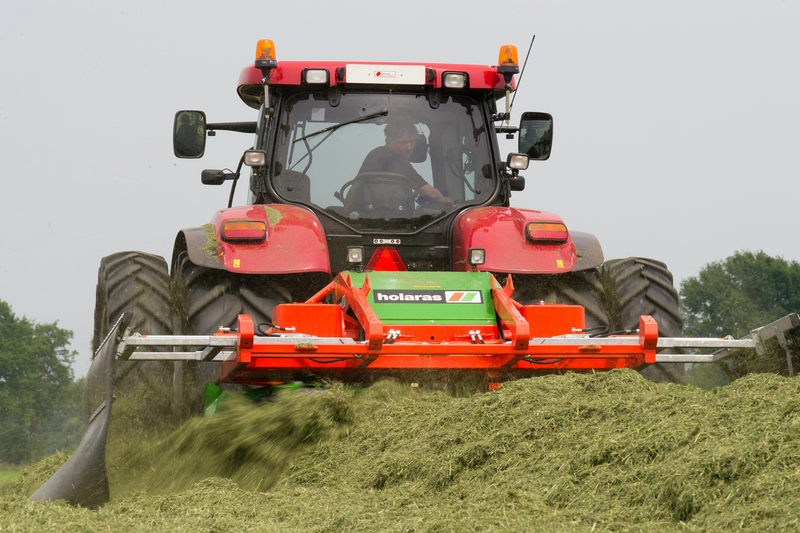 In Europe, the Viking Holaras Grass Spreader has been for many years the preferred contractor’s and dairy farmer’s tool for producing top quality silage; whilst maintaining the ability to keep the operator and machinery safe during the process. This is maintained by being able to work the full width across the clamp even to the extremities of the clamp shoulders and edges by the even spreading action of the two spinning rotors which enable thinner layers to be produced to enhance better consolidation of the clamped product. The machine is also particularly good at separating lush and young grass leys and forage wagon chopped grass; which normally pose a problem at ensiling due to the often long and tangled nature of the grass. The spreading width of the machine is six metres; this can be controlled by the two hydraulically foldable and extendable rubber skirts which act as a buffer to allow the grass to be accurately spread across the clamp and also to the edges and corners. The Viking consists of two very heavy duty PTO shaft – driven gearboxes designed to manage up to 600 HP, so the use of a Claas Xerion for example is ideal with the combination of being able to drive in different driving modes; such as crab steer and the weight of the machine on the clamp. It can also be fitted with an additional sub-frame to allow the fixing of a wheeled loading shovel as an optional extra. Furthermore the Viking can also be fitted with an option of a folding grass fork and also a hydraulic push-off fork option as well. Prices start at £17,950.00 Retail Price for a standard Viking.